Are you frustrated with the daily struggles of tooth loss? If you are, you’re not alone. Millions of Americans experience the same difficulties. Ill-fitting dentures, aging dental bridges, or annoying spaces in the mouth can make everyday tasks like chewing, speaking, and even laughing and smiling difficult and embarrassing. But there is a solution. 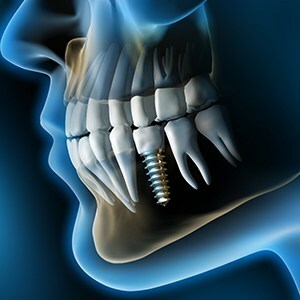 Dental implants from Advanced Dental Care could solve all of your tooth loss problems permanently! 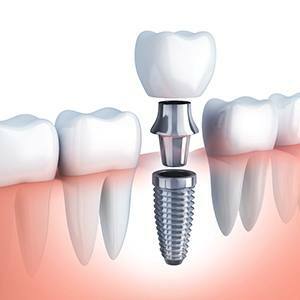 A dental implant is an artificial tooth root that is placed into your jaw to securely anchor a replacement dental crown or denture. 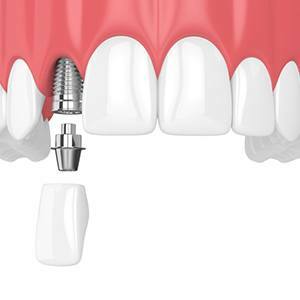 Why Choose Advanced Dental Care for Dental Implants? 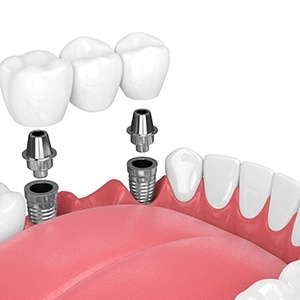 Top to Bottom Solution: Because dental implants bring back both the root and crown of a tooth, they are much more stable compared to traditional bridges and dentures. With an implant, a patient can eat whatever they like without worrying about embarrassing slippage. 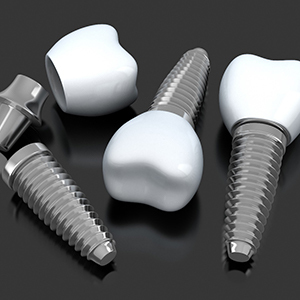 Natural Appearance: Every implant we place is topped with custom-made restorations. The dental porcelain we use is strong, extremely lifelike, and built to stand the test of time. Versatility: Whether you are missing just one tooth or are in need of a complete denture, implants are still a viable option. High Success Rate: Implants are successful for 95-98% of patients. Bone Retention: Dental implants are the only treatment available today that can stop bone loss after tooth loss. This not only protects the foundation of the remaining teeth, but also preserves the overall shape of a patient’s face. Longevity: A dental implant can last for over 30 years with just standard oral hygiene. A single porcelain dental crown supported by a dental implant root can be placed between two healthy teeth without disrupting them at all. This is a much more conservative solution compared to a regular bridge, in which the neighboring teeth have to be filed down. For patients with nonconsecutive missing teeth, implants can be used to hold multiple crowns throughout the mouth and even a partial denture. If a patient has larger gaps in their smile because of consecutive missing teeth, just two implants can support a strong and reliable bridge. Patients who are missing most of their teeth tend to suffer from significant issues, but an implant-retained denture can quickly fix all of them. Using just four to six strategically positioned implant roots, a custom-made prosthetic can be attached directly to the jaw to give a patient a set of teeth they can trust, whether they are smiling or biting into their favorite food. After you have been approved to get implants by our team, the first step is to have your new root(s) placed into your jawbone. This is done via a minor surgical procedure performed by our in-house periodontist Dr. Joseph Yang. Afterward, your mouth will be given a few months to heal before you come back to Advanced Dental Care to have your restorations attached to the implants. Depending on your situation and how many teeth are being replaced, the entire process can take anywhere from six months to a year to complete. Our team is able to use dental implants to replace any number of teeth, and because of this, the cost of the procedure can vary quite a bit from person to person based on their particular needs. Before we begin your treatment, we’ll go over all pricing information so you’ll know exactly what you’ll be expected to pay (as well as how we can use your insurance/financing to make the treatment more affordable). While dental implants do tend to cost more than traditional bridges and dentures, they are also able to last for decades longer, which usually ends up saving patients money in the end because they don’t have to have their teeth periodically redone. 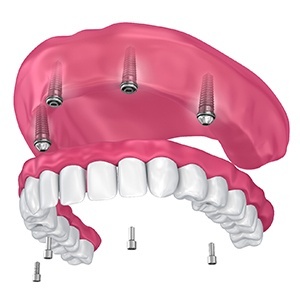 You can enjoy a new lease on life with dental implant tooth replacement. To permanently restore your natural smile and quality of life, schedule a personalized dental implant consultation with Dr. Jorgenson at Advanced Dental Care today. Our team is highly qualified and now delivering quality dental care daily throughout Irvine, Newport Beach, Huntington Beach, and the surrounding Orange County, CA communities.